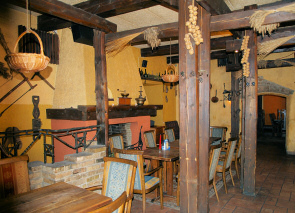 Craftsman’s Inn (In Lithuanian Amatininku uzeiga) is popular for its high quality Lithuanian food at reasonable prices and cheap beer. One of the main assets of The Craftsman Inn is that the kitchen stays open late till 5 a.m. in the morning (6 a.m. at the weekends) and is very convenient to drop by if you are hungry and looking for a restaurant after a night out in one of the Vilnius clubs. The cheerful craftsman sitting above the door outside suggests that the theme inside is that of olden times Lithuania. I loved interesting decorations hanging on the walls, featuring rusty hammers and other items of genuine craftsmen tools. It felt cosy surrounded by the dark wooden furniture and wooden beams, and they also have candles lit on the tables at any time of the day. The Inn has a happy buzz in the evening and is more popular with groups of people than with couples looking for an intimate dinner. Lija and I have enjoyed sampling different Lithuanian food at Amatininkai Inn on three separate occasions with both food and service being excellent. The staff were attentive to our needs and we've never felt rushed to finish our meal. The first time I enjoyed a tasty breakfast of soft eggs served on a bed of crispy pieces of bacon and mushrooms, which was creatively presented on a traditional pan. 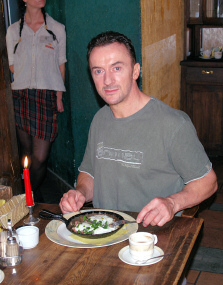 We came back the same evening for dinner and I was tempted to try the Pig’s trotter(traditional Lithuanian food) which as I noticed was a popular choice with the other diners. The last time we visited the place was late in the evening when we dropped by for an Irish coffee. We were sitting close to the entrance, sunk in one of the comfortable leather sofas in the bar area.The Irish coffee to my taste was very good, even better than I have tasted in some places in London.